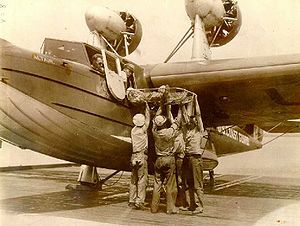 The General Aviation PJ was a flying boat produced in the United States in the 1930s as a search-and-rescue aircraft for the Coast Guard. Originally designated FLB (for "Flying Life Boat"), it was a conventional high-wing cantilever monoplane with a flying boat hull and outrigger pontoons mounted on the wings slightly outboard of mid-span. The twin pusher engines were carried in separate nacelles on pylons above the wings. The hull was a monocogue metal structure, and the wing was a wooden structure skinned with plywood. The basic design was based on that of the Fokker F.11, but substantially enlarged (Fokker's American operation was renamed General Aviation after purchase by General Motors in 1930). While not a true amphibian and able to land on dry land, the PJ was equipped with retractable undercarriage that functioned as its own, self-carried beaching trolley. Five examples were operated by the US Coast Guard during the 1930s, named Antares, Altair, Acrux, Acamar, and Arcturus (hull numbers FLB-51 through FLB-55). In 1934, Arcturus underwent a major refit that included a redesign of her engine nacelles, converting these to tractor configuration. Taylor, Michael J. H. (1989). Jane's Encyclopedia of Aviation. London: Studio Editions. pp. 417. "For Coast Guard Service". Flight: 844-45. 24 August 1933. http://www.flightglobal.com/pdfarchive/view/1933/1933%20-%200396.html. Retrieved 2008-04-02.